Halloween is a great time for both children and adults. And it’s also a great way to show your creativity with different crafts and DIY projects that are fun to do during the month of October. If you are planning any type of Halloween party then why not make these homemade Halloween party favors, which are sure to be popular with both kids and adults. And even if you don’t have anything special planned, they are still a lot of fun to make. 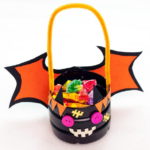 Once you make these party favors, which are like mini trick or treat bags, you can simply fill them with an assortment of candy for each guest to enjoy and take home after the party. Warning: Small parts, such as the buttons can be a choking hazard for young children. These are more of a fun decoration and not a toy so keep that in mind when making them, and remind the kids to keep them away from their little brothers and sisters. Most, if not all of these materials can be found at local craft stores like Michael’s or Hobby Lobby and even Walmart. 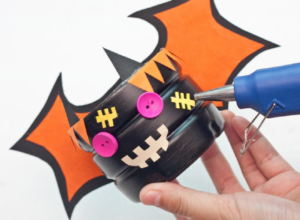 And while these are great for kids to make, you will want to help them with some of the cutting and gluing. Overall, this makes a great arts and crafts project that the family can do together! 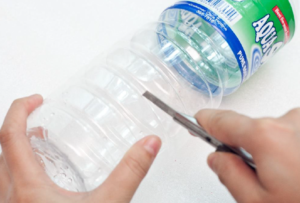 Step 1: Using an X-Acto knife, carefully cut approximately 1/3 off the bottom of the water bottle (parents or an older sibling will need to do this step). Discard the upper bottle part of the bottle. Be sure to cut the bottom evenly since this is the main part of the party favor. Luckily most water bottles have ridges, which making it easier to cut evenly. 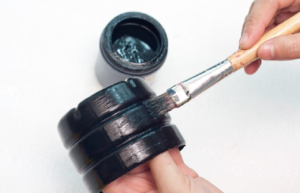 Step 2: Next you want to paint just the outside of the bottle with the black acrylic paint. It’s easiest if you paint the bottom first then tip it over and let it dry at least an hour. Once it is dry go ahead and paint the top part and let it dry. Be sure to paint in the same direction to give it a nice, uniform cover. You will want to paint at least two or even three thin coats until you get a decent coverage and give it at least an hour to dry between coats. 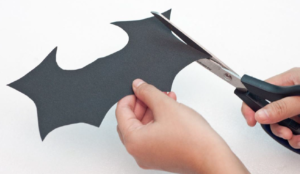 Step 3: Draw a bat wing on black construction paper and cut it out. 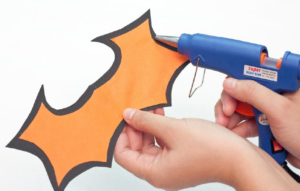 The kids can show their creativity by drawing their own bat wings, or you can find cute bat wing templates online. 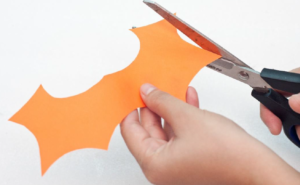 Step 4: Repeat with the orange construction paper but cut the orange wings a little smaller. Step 5: Place the orange bat wings on top of the black bat wings and center the orange so it looks even. From here you can hot glue them together. The best way to do this would be to glue just a small section of the wings at a time while holding the rest in place. Step 6: Next you can hot glue the bat wings onto the body of the bat. Keep in mind that you will be hot gluing the orange side as shown in the image below. You also want to make sure that the wings line up evenly. 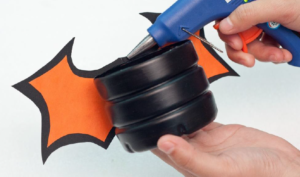 Tip: If you are making several of these DIY Halloween party favors then you can reverse the wing colors on half of them. There will be less contrast but they will still look great! Step 7: In this step you glue the buttons on for eyes, and cut out different pieces of construction paper for the mouth and ears, and also cut out little orange triangles to decorate around the top of the favor. At this point you can also cut out additional shapes to decorate your bat as well. Tip: If you prefer, you can use construction paper instead of buttons for the eyes. hold them securely in place. 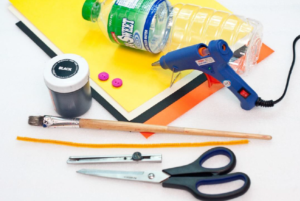 You can use black or orange pipe cleaners and you may choose to make the handle long or short. Just make sure that you allow enough room under the handle to make it easy to add and remove the candy. And there you have some cool Halloween party favors! And these make great kids Halloween party favors, they are also a fun party favor for the adults as well! Just consider how cute these would be as as place holders at an adult Halloween party. And of course the kids, tweens and teens will love them as well. Even if you don’t have a party planned, they are still fun to make to use as a little candy dish during the month of October. You could also get creative and make other Halloween inspired favors as well such as Jack-O-Lanterns. 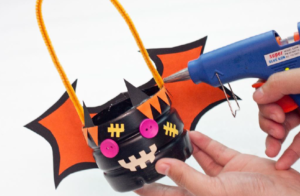 Either way, this is a great Halloween craft to do with your kids! 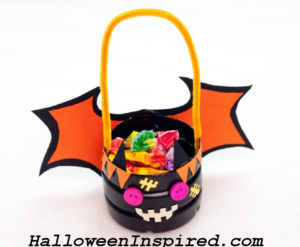 This entry was posted in Crafts and tagged cool Halloween party favors, diy Halloween party favors, homemade halloween party favors, kids Halloween party favors on August 13, 2016 by Halloween Inspired. Halloween Dabbing Shirts – A New Trend for 2017 and Beyond?